- Publisher This collection of lighthearted, humorous, and occasionally poignant devotional essays is written for moms who know all too well the demands of a busy life. Writing "from the trenches," author Helen Middlebrooke points out that God is always present, even in the tedious and frustrating details of life. Her insightful essays will lift the heart and inspire the soul as the reader comes to understand that all of life is sacred-that "washing dishes is just as holy as preaching sermons." Uses Scripture from the KJV. 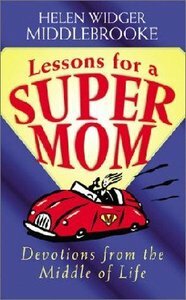 About "Lessons For a Supermom (Supermum)"
This collection of lighthearted, humorous, and occasionally poignant devotional essays is written for moms who know all too well the demands of a busy life. Writing "from the trenches," author Helen Middlebrooke points out that God is always present, even in the tedious and frustrating details of life. Her insightful essays will lift the heart and inspire the soul as the reader comes to understand that all of life is sacred-that "washing dishes is just as holy as preaching sermons." Uses Scripture from the KJV.